Following on from the PGA Sultan and Pasha courses at Antalya Golf Club, the Montgomerie Maxx Royal (formerly known as the Papillon Golf Club) is the third European Golf Design project in the Belek area with Colin Montgomerie marketed as the course’s attention-grabbing headline designer. Monty's 18-hole layout is part of a multi-million euro golf and hotel development that includes a world-class golf academy and a 5-star hotel. The course opened for play in 2008, quickly establishing itself as one of the best in an area that’s not short of quality new golfing facilities. Many of the fairways play through mature pine forest and with eight lakes on site there are several water hazards to be avoided during a round. In November 2013, the Montgomerie Maxx Royal hosted Turkey’s inaugural European Tour event – the Turkish Airlines Open by the Ministry of Culture and Tourism. Frenchman Victor Dubuisson hung on to win the 2013 event, securing his maiden European Tour title by two shots from Jamie Donaldson with Justin Rose and Tiger Woods finishing two strokes further behind. Colin Montgomerie made his 600th European Tour appearance in the 2014 Turkish Airlines Open, but it was Brooks Koepka who lifted the title after beating Ian Poulter by one shot. Along with Colin Montgomerie, EGD was introduced to the project in 2006 by the Papillon Hotel Group who were looking to create their first golf resort. The site, which had previously been used by the Turkish Government’s Forestry Department as a commercial forest, had been earmarked for golf as part of a tourism initiative for the area. Although densely covered by pine trees it was clear that sandy, rolling landscape below the tree canopy was ideal for golf. Right from the start the environmental impact and sustainability of the development was a major consideration and resulted in a design philosophy which combined the natural features of the site with the strategy of the golf course. The result was a golf course which utilised the natural sandy areas as hazards which come into play on more than half the golf holes and also provide a buffer between the maintained areas and the native vegetation. Since the completion of the golf course the club has followed up with this environmental commitment and has recently become a registered participant of the Golf Environment Organisation (GEO) certification programme. 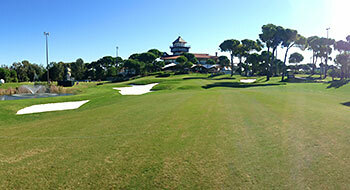 As with many courses in Belek, the club house and practice facilities at the Montgomeri Maxx Royal are top notch! The service is also great. I had the pleasure of playing the course during the Turkish Airlines Open Pro-Am so I must say that the conditionning was great! The greens roled pure and fast, and the fairways were quite firm and fast, a nice surprise! The layout is classic target golf. The course will not blow you away, but it is a fair test and makes for a very nice day of golf! Seeing the pros negociate the course was all the more interesting. If you are planning a trip to Belek, this is a good golf course to look up. Was lucky enough to play in the Turkish Airlines ProAm here, so was expecting to see the course in absolutely perfect condition. Sadly that wasn't the case, after heavy rain the week before, the greens started chewing up and the fairways were very scabby (resulting in preferred lies) during tournament play. Away from the condition of the course, the actually layout and whole facility is absolutely fantastic. Clubhouse and practice facilities world class, and a magnificent golf course weaving through tall pines, a number of huge water hazards, wasteland and on sight villas. It really is a fantastic place to play. The course gets off to a gentle start with a pretty straight forward par 5. When you get to the 4th that's when the challenge begins to start, a cracking par 5 over water followed by another brilliant par 3 over a huge lake. The stretch of holes 4-9 are very strong, and a challenge where your round can go either very bad or very good if your not careful. Par 3 8th is a very good hole until you get onto the green, where there is a huge mound in the middle of the green that can throw the ball off in every direction. The greens are extremely undulating but they've gone too far with this green. On the back 9 there's a lot less water but a lot more strategically placed bunkers/ and trees. The trees in the middle of the fairway on 13 are a bit silly on what is apart from that a very good par 5. The same can be said for the driveable par 4 15th. A huge oak tees surround by bushes guards the front of the greens so if your tee shot isn't placed correctly, you can have no shot from 50 yards off the greens. Plenty of balls have for stuck up that tree over the years. My favourite hole on the back 9 was the 18th. A spectacular par 5 finishing hole, where you alot your tee shots through a narrow shoot in the pines leaving a 2nd shot to a raised green over a giant bunker with water lurking down the left and the magnificent clubhouse providing a memorable backdrop. All in all it was a sensational day on a fantastic golf course. The only shame been the condition being a little iffy, but the greens were the most undulating I've ever putt on and run very fast. I must say a little underwhelmed by the Monty. Don't get me wrong it was a nice track but i get the impression the European Tour Pro's will rip it apart later this year. Not excessively long and with open fairways this is a scoring course. I expected the greens to be it only defense but they were very slow. Some great strategy holes (par 4's) and the par 5's were easily reachable in 3. Great clubhouse and well looked after, only 20E for a buggy and 1E for a strokesaver. The Montgomerie course has been built on similar land to that of the Cornelia Faldo course close by - my opinion though is this is slightly behind in the rankings. There is no doubt that golfers will enjoy the course as it (dare I say it), is a little easier. The pick of the holes for me are the short par-4 3rd where a tee shot of around 220 yards will leave an uphill approach of about 100 yards; The 5th hole can look like some holes on other courses of the region as it is a par-3 over water, I like this one especially as the best way in is with a fade, which should take out the two bunkers left of the green. After playing the par-3 8th, there is a fairly unique walk through the villas of the resort and then the Maxx Royal hotel appears on your left (best hotel in Belek) just before the 9th tee. The 9th is my favourite hole on the outward nine…. a par-4 with water on the right of the fairway and short of the green – it is the bunker placed behind the green that makes this hole special; the water says ‘don’t be short’ and the bunker says ‘I’m here’ if you are long – really good design. I think that the back nine is not as good as the front but this too has a strong finishing hole .. a par-5 where every shot must be exact as a sloping fairway and plenty of wasteland and bunkers down the left are a real threat. Post round drinks on the clubhouse decking looking back down the 18th hole are a must – I will play here again but a few other Belek courses get the nod over the Montgomerie for me. I've already played 10 courses in Belek, Turkey and this one is the best course (I would say, slightly better than Carya and PGA Sultan, which are also among favorites)! 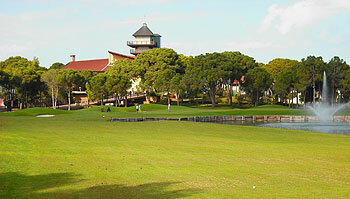 I played at the end of October, it’s beautiful, good design, very good quality (both - fairways and especially greens). To play this course is a must! I played three rounds at the Montgomerie course in april this year and it was truley magnificent! The layout is thought through, a risk and reward style course and very tough, especially for high handicaps, since some of the holes require a little bit of carry, over water hazards and waste areas. I played from the black tees all three rounds. The greens where probably the best ones I´ve ever played and the over all shape of the course was great. I also played one round at Cornelia, but I liked the Montgomerie course the greens at cornelia could not beat the ones at montgomerie. As do trees at the 2nd on Valderrama, Europes No1.Golf was never meant to be easy.....did u watch Choi lay up on the 11th at Sawgrass and he went on to win!! The trees in the center of the fairway be that in Valderrama or anywhere else are (with a very few exceptions) architechtural malpractice. The last review is totally retarded though, since the course deserves at least a 3-ball mark. Very good golf course in very good conditions (probably the best greens in belek). yes the course is quite tough, especially from the back tees, but is this a reason to rate it very poor?? ?